Michael Fassbender returns to big screen with an equally big fake head. Have you ever wondered what it’s like to spend more than a year in a small Irish locale composing an album? How about doing so alongside a man wearing a huge fiberglass head? If either of these two interests you, “Frank” should be on your movie bucket list. Inspired by Frank Sidebottom, the alter ego of the British musician Chris Sievey, “Frank” is odd, pleasing, memorable, and, to some extent, endearing. It starts off with Jon (Domhnall Gleeson), an independent musician, walking along a beach trying to find inspiration for his new song. We get to hear his thoughts while he tries to make up lyrics based on every single thing that catches his attention. As it becomes clear, he is definitely not making any kind of sensible progress until he coincidentally meets an indie band. Jon gets to join the band for a trip to Ireland to record their new album. We are introduced to the members of this small band, which includes Don (Scoot McNairy), the manager; Clara (Maggie Gyllenhaal), the aggressive Theremin player; and Frank (Michael Fassbender), the band’s leader, who wears a giant fake head. Every member of this band has a distinctive backstory, but the main focus of the movie is Jon, who struggles to find his place in the band and gets particularly interested in Frank and the story behind his mask. Thankfully, the movie manages to keep Frank mysterious enough to hook viewers until the end. At first, I was doubtful of the movie for casting Fassbender as a character who is unable to use any kind of facial expression. Frank’s character must solely communicate through his voice and body movements, though Fassbender is known for making the best use of his face in his works such as “Shame” and “Fish Tank.” However, I must say that after 30 minutes into the movie, any doubts that I had about Fassbender were totally destroyed, and I was hooked. Gyllenhall is also at her best as an unwelcoming, badass character. Her layered performance adds extra spice to the movie. Behind her calm face, there is an aggressive, frigid woman, and yet beneath that there is still a mysterious serenity. The cinematography and soundtrack are brilliantly done, and they collaborate to ensure that your journey through the story is satisfying, both visually and aurally. Ireland’s fog-shrouded scenery perfectly fits the film’s soundtrack. 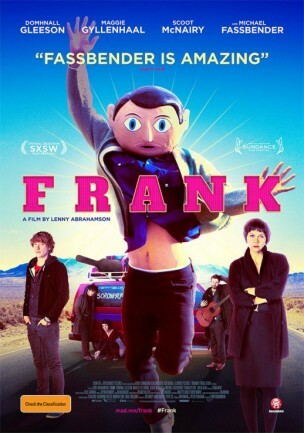 Overall, Frank is not your weekend, late-night kind of movie. It requires your attention, and it will reward you in exchange for the time you commit to watching it. Fassbender shows us his flexibility as a talented actor who doesn’t even need his face to be fully expressive.